Christmas came early to Denmark as the World Santa Claus Congress opened in the capital Copenhagen, for the 54th year in a row. The gathering will discuss important matters such as standardizing the width of chimneys to enable Santas to slide easily down them as they deliver presents, and debate weight regulations for the red-suited, white-bearded Christmas figure who tends to be on the heavy side. It will also decide the date on which Christmas ought to be celebrated. “We normally cannot agree on the date for Christmas, but in Denmark we believe it should be on the 24th of December. But we will vote on that on Wednesday,” joked Henrik Jacobsen, Director of the Danish Santa Association. It’s said that Scandinavian Santas want Christmas shifted to Dec. 24, while their Russian counterparts prefer Jan. 6. But there is also a practical element to the proceedings. “It is an important event because we can get together and talk at a time when we are not so busy, try and solve our common problems, and agree on how to do our job best at Christmas time,” explained Jacobsen, who has been a Santa Claus for 35 years. With around 120 participating Santas from the United States, Britain, Japan, Canada, Russia, Germany and the Nordic countries, this congress maybe is the world’s oldest and largest Santa convention. 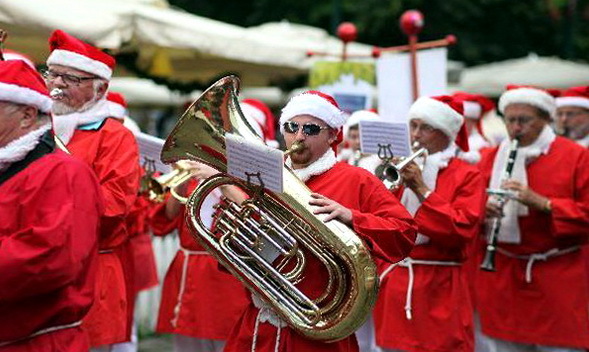 It is held in July to avoid Santa’s busy period at the end of the year. The event is an opportunity for modern day Santas to discuss new ways of preserving the name and tradition of Santa Claus. “If you are Santa Claus, you want to go and meet other Santa Clauses. This way, we can have the same story when kids ask us what we are all about,” observed Santa James from Scotland, who was a chartered accountant before retiring and becoming a Claus. But amidst a sea of red velvet suits, flowing, white beards – both fake and real – and dozens of ‘helpers’ decked out as elves in pointy, green hats and furry reindeer suits complete with fake antlers, it is hard to take things seriously. And the Santas certainly do not. “I am from the North Pole of course, but my summer home is Southern California,” joked Santa Ron, when asked where he came from. Meanwhile, Santa James has a simple explanation for the logistical mystery surrounding how Santa delivers toys to children all over the world on the night before Christmas. “We, the Santa Claus Corporation, own all the postal delivery vans. We lease them to the post office for 364 days, but we use all the vans on that last day,” he said with a straight face. Co-organised by the Danish Santa Association and Bakken, Denmark’s oldest amusement park, the annual meeting has run without interruption since 1957. Today, participation is open to those who can document that they are a practising Santa Claus, or are a member of a national Santa organization. This year, the three-day long event will include public activities such as the Santas feeding reindeer at Copenhagen Zoo and leading parades through the capital’s historic old center. Previous Previous post: Travel to New York for a destination wedding.